Its been a long time since I baked a bread. A cool rainy weather called out for some soup. Making soup for dinner meant a home baked bread. I dug out my ‘to try list’ and made masala bread. The first time I had made masala bread was when I was attending the baking technique classes in Bangalore. Adding all sorts of masalas to the bread was totally new to me… at that moment I frowned at the idea of adding coriander, onion, garlic, curry leaves, chillis, etc to the bread dough. Wondered how it would taste. After baking it and sampling it, I found it very delicious. The other students were surprised that I’d never tasted a masala bread. Forgot about the bread till I opened the ‘to try list’. Masala bread is a good accompaniment to any smooth soup like broccoli, cauliflower, tomato soup or any soup of your choice. The leftover bread made a lovely in between snack as it tastes good on its own. The charming thing about baking this bread is that you can add the masala according to your taste. By masalas I mean onion, garlic, green chillis, ginger, coriander, fenugreek, curry leaves, etc. Feel free to add whatever you want. As to exercising my arm, yes I still knead the dough with my hands… not too impressed with my kenwood machine. My arms still are not slimmer.. how can they be after eating so much bread. The motto at the moment is knead, bake and eat. Since I baked this bread for the first time at home, I’ve used it to make sandwiches and it adds that extra flavor to it. I’ve also made them into buns to serve them as individual portions for a dinner party. Mix the flours, salt, turmeric powder, cumin seeds and sugar in a big bowl. Add yeast and mix lightly. Add warm water and mix. Bring the dough together into a big lump. Dust the worktop with some flour. Place the dough on the work top with flour and begin to knead the dough. Knead it for a good 10-15 minutes till the dough is smooth and silky. Make sure its not too stiff or too sticky. Grease the dough and ball with some oil. Place the dough in the bowl. Cover it with a lid or damp tea towel and place the bowl in a warm place. Let the dough rise till its double the size. Mine took 1½ hours. In the meantime get the filling ready. Mix them all together in a bowl. Take the fermented dough out of the bowl. Deflate it gently and roll it into a circle about 8-10 inches in diameter. Spread the filling over the dough. Gather up the edges and push it gently into the middle, trying to enclose the filling. Let the dough rest for 5-10 minutes in the bowl. Gently knead the dough and shape it into a ball. Place the dough on a greased baking tray. Let the dough ferment for 45-60 minutes till its double the size. Brush the top of the risen dough gently with milk. Place the bread in the hot oven to bake for 10 minutes. After 10 minutes reduce the temperature to 180°C. Bake the bread further for 20-30 minutes or till the top is light golden brown. On knocking the bottom of the bread, it should sound hollow. Place the bread on a wire rack to cool. Slice and serve the bread with your favorite soup. Add finely chopped curry leaves. Make sure the dough is not too soft as after adding the filling it will become a bit soft and sticky. I used both plain and wheat flour. You can use plain flour only if you like. Knead the dough welling the heel of your palm. i love savory bread more than sweet or regular one. looks awesome. Thanks for the entry..the bread looks so good and nicely baked..
All the ingredients went for the filling makes me drool. Am sure this masala bread will definitely please my tastebuds for the sure. Thanks Priya.. we too love it. Baking are always fascinating me and again you have made this bread perfectly. And that tray of masala bread is alluring me to pick up some and gobble down. Thanks Jolly, I too like the rustic look of the loaf. Yes Amrita, only realized that after I learnt how to bake it. Now I see it everywhere when I’m in Bangalore. But like my homemade one. Love masala bread, but have never tried making them at home! Your attempt to make and the gorgeous pics of this bread are so tempting me to go for it soon! Thanks for sharing your version dear! Thanks Vanitha, please try it as it is a very flavorful bread. One can enjoy it on its own too. Masala bread looks fantastic. I am yet to master the art of bread baking. Thank you so much Lata. Simply fabulous! What a lovely idea for evening tea time! This bread won’t even need any spread with it, just a good cup of tea to accompany it. Thanks Maria and its true you don’t really need a spread. However one can always serve it with chutney for that extra zing. Thank you so much Lathiya. Masala bread is one of the favoring my home, kids love it with some butter Andy hubby and I enjoy with a cup of chai formorning breakfast. Your is so nicely baked.. looking rustic, looks so crusty and delicious!! I bet this tasted amazing – makes a wonderful change to add those flavours to bread! Thanks Heidi. It does make the bread very tasty with so make spices and flavors. I love the aroma of homebaked bread, and when you bake masala bread, I would drool. Such a flvourful and tasty baking recipe. Great for picnic too. Thanks Jagruti and you’re so right it would make a great picnic bread too. This sounds delicious. I love the flavours you have added to your bread. I can imagine it being very tasty with soup like you said. Thank you so much Cat, it certainly is. this is such a wonderful bread, the filling sounds amazing! What a wonderful recipe! I love masala flavours and I know that my husband (who is obsessed with chillis) would LOVE this. Thanks Mandy, then in that case you could bake this bread for him. Before now I had not heard of masala bread. I can imagine how tasty it is and how magnificent it must smell when baking in the oven. Thanks Sara, its commonly sold in the bakeries in India. Masala bread looks so irresistible. The ingredients used for stuffing are making me hungry. Thanks for sharing this lovely recipe. Thanks Pavani and you’re welcome. I love this bread and make it often.. never tried with onions though.. next time I will add them. Try with onions Shobha, its tastes good. Also can add chopped curry leaves. I like the idea of savoury bread with all sorts of fillings.it sounds like a meal on its own. Thanks Mina, it definitely is, a meal on its own. 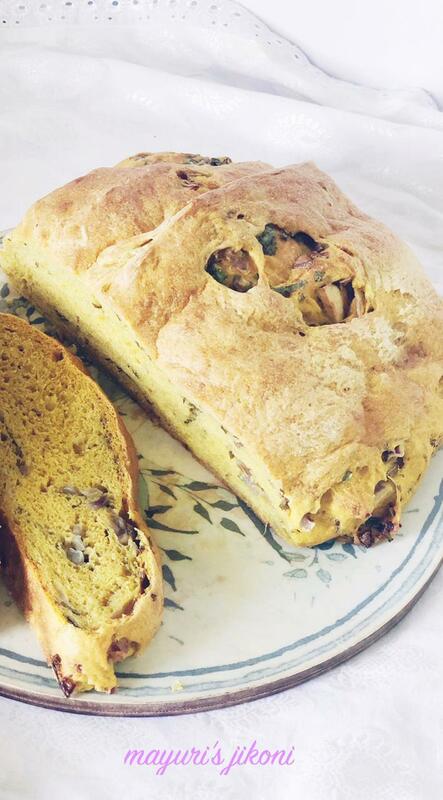 Masala bread looks so tempting and delicious.I liked the stuffing you used in the bread.Thanks for the lovely share. Nothing beats the taste of home made bread. I love the filling you have used in it. Thank you so much Nayna.